Dental veneers are material shells placed over the visible area of teeth, and can be used to correct a number of dental issues. In addition to giving you a brighter and whiter smile, dental veneers can be used to repair teeth that have become broken, chipped, or cracked, as well as teeth that are worn down, misshapen, or misaligned. 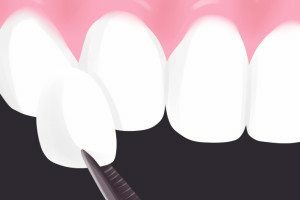 There are two procedures for placing dental veneers: direct and indirect. In direct placement, a composite resin is placed on your teeth, and is usually referred to as dental bonding. This method has the advantage of being quicker, and it can be used on specific portions of your teeth, rather than covering the whole front tooth surface. If you only have a few teeth you want repaired or covered, the direct method may be your best/preferred option. In indirect dental veneer placement, you will need two appointments. During the first visit, your teeth will be cleaned and prepared for the veneers. Then a mold of your teeth will be taken and sent off to a dental laboratory where your custom veneers will be made. During your next appointment, your dentist will apply a local anesthetic and remove a small portion of your tooth enamel. A special adhesive cement will then be applied, and the veneers will be placed on your teeth. A special light is used to quickly dry the cement, locking the veneers into place. Dental veneers provide you with brighter, healthier-looking smile for much less time and effort than dental crowns. Veneers are durable and stain-resistant, making them an excellent choice for anyone who wants to keep their teeth looking bright and healthy for a long period of time. If you have questions about dental veneers, or want to find out if you are a good candidate for the procedure, call Stonebridge Dental today at 972-547-0554 for a consultation. Our trained professional staff can answer any questions you might have, and we look forward to giving you the smile you’ve always wanted.